These continue until there is no longer a need. The Mission Team chose “Random Acts of Kindness” as our special mission project for the month of December 2016. It was received so well, and was very successful, that our Pastor made it clear that while we focused on this, we really ought to make this a way of life in representing our Lord Jesus in our daily life. So this is an on-going mission that should continue to grow both within our church body and our community. One example of “Random Acts of Kindness” is when you are in a food line or a line at any store and you pay for the person’s food or purchases behind you in that line. We have printed business cards for you to give to the cashier and they in turn pass that card on to the person that has benefitted from you generosity. The business cards say: “RANDOM ACT OF KINDNESS - A free gift to you with no expectation of return! - This is done because of the love that God has shown us. - From your friends and neighbors at Lake City United Methodist Church. PLEASE PASS IT ON! It is our hope that this person not only be surprised and experiences the love and joy that come with a Random Act of Kindness, but they will do a Random Act of Kindness also. There are many way to do Random Acts of Kindness…….There are more examples on the Lake City United Methodist Church Facebook page. You are only limited by your imagination!!!! The business cards are available in the narathex. Please take them and be a part of Lake City United Methodist Church’s special mission. Let God talk to you, we can make the world a better place. Pick up some of the business cards, pictured at the right, in our Narthex or the office. We'd love to have to order another 500 cards and more as these get used up. 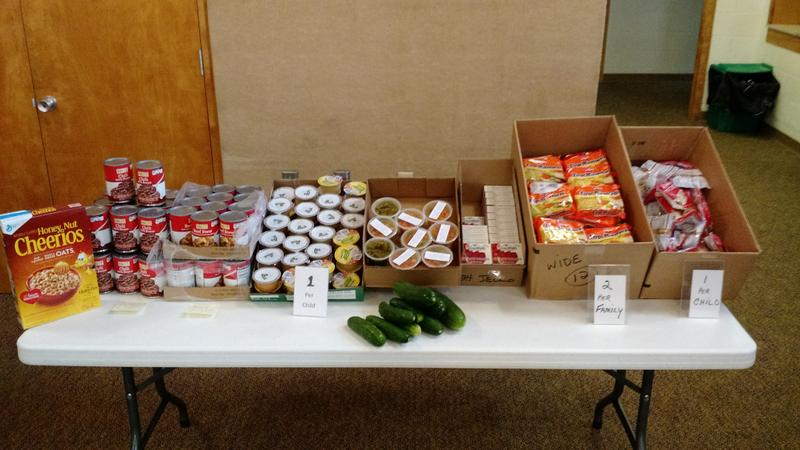 Packing for the Weekend was implemented in the Lake City Community in 2012 to supply food for children of families in need on weekends supplementing the school subsidized lunch program available to them during the week. The concern beyond simple humanitarian considerations is the understanding that nutrition is essential to a robust learning experience. The program operates with a team of community volunteers through the United Methodist Church in Lake City. 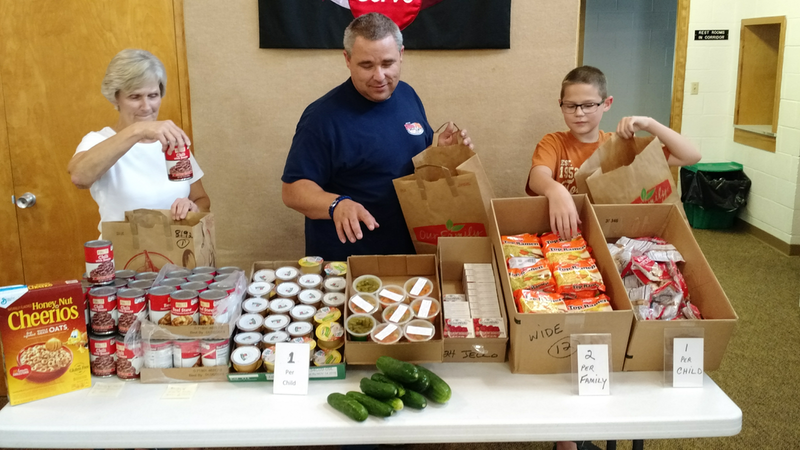 The United Way of Red Wing provides the basic funding for the program through purchases of food from Channel 1 in Rochester. Local businesses, organizations, and individuals also contribute to that support with both financial and food donations. The actual work of packing and delivering a bag of food for the weekend is done by a team of 3 volunteers at 2 pm each Friday afternoon at the Methodist Church year around. There are a total 12 volunteers involved in this effort currently serving 22 families and 53 children. If you would like to make a donation to this mission please make your checks payable to “United Way of Red Wing”. Please note in memo line “Packing for the Weekend Lake City”. More info on giving. If you would like to volunteer to help with this mission project, click here. The Prayer Shawl Ministry began in 1999 after Susan Izard received a shawl from a friend for her Quiet Room. She learned about knitting shawls at the Hartford Seminary. The shawl knitting ministry was created by Vicky Galo and Janet Bristow after they completed the Women’s Leadership Institute. The prayer shawl ministry is an amazing outreach of love and compassion. 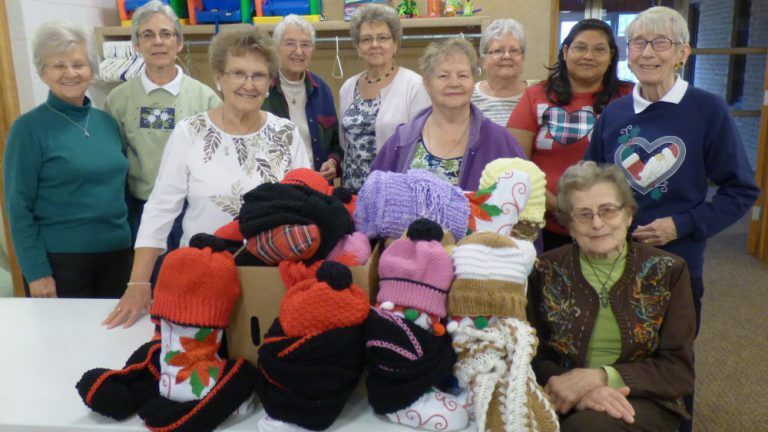 Lake City United Methodist Prayer Shawl ministry began when several church ladies went on a bus trip. They talked to other knitter on the bus and it occurred to them that this church needed a Shawl Knitting Ministry. A few ladies knit or crochet shawls and others delivered the shawls to people who needed them, starting in 2004. The Knit Wits Prayer Shawl Ministry group was established in early 2005. The Knits Wits meet every Monday morning to knit, to pray, to talk with one another and to bless the shawls. They give away 50 – 60 shawls a year, to parishioners, friends, family members and others who are in need of a prayer shawl and God’s love and warmth. The preferred yarn for the Prayer Shawl Ministry is Home Spun yarn. These ladies pray as they knit and crochet the shawls. The finished shawls are given away and by the time a person receives it, the shawl is filled with prayers. When they wrap themselves in it, they can feel the warmth and love that the prayers and yarn have become. For the knitters, these shawls deepen the understanding of God’s presence in our lives. Also, invites us to care for our neighbors with thanks giving and joy. The Knit Wits also knit hats and scarves, as well as pot holders and wash clothes for the Pricilla Circle’s Stocking project each winter. If you are drawn by this mission, you can help by praying. Each Prayer Shawl takes three skeins of Home Spun yarn and the funds for this yarn are very low. You can make a check out to Lake City United Methodist Church and put "Knit Wits Prayer Shawl Ministry" in the memo line. More info on Giving. If you would like to serve in this ministry, click here.